← Entertainment Weekly – July’s Must Reads! What was the “why now” moment for you to write this brave and moving book? Thank you for those kind words. I’m not sure there was one specific moment I could point to. For almost two years after my wife’s death I kept notebooks where I documented my days and nights, my interactions with friends and associates, even strangers. The notebooks were for me alone, a way to see clearly at a time when I could not. When I was invited to the arts colony, Yaddo, I thought I would work on a novel I’d started before my wife’s death, but got there and found I was still unable to concentrate on fiction and began transcribing my notebooks. I still didn’t think of it as a book, at least not one I would put into the world. What changed was allowing a few friends to read parts of what I’d written, all of whom were enthusiastic and urged me to consider publishing what I’d written. One writer friend, who I respect tremendously, said “Men do not write these kind of book, so you must continue, must finish.” Still, until the moment I sold the book I kept thinking I’m not going to do this! 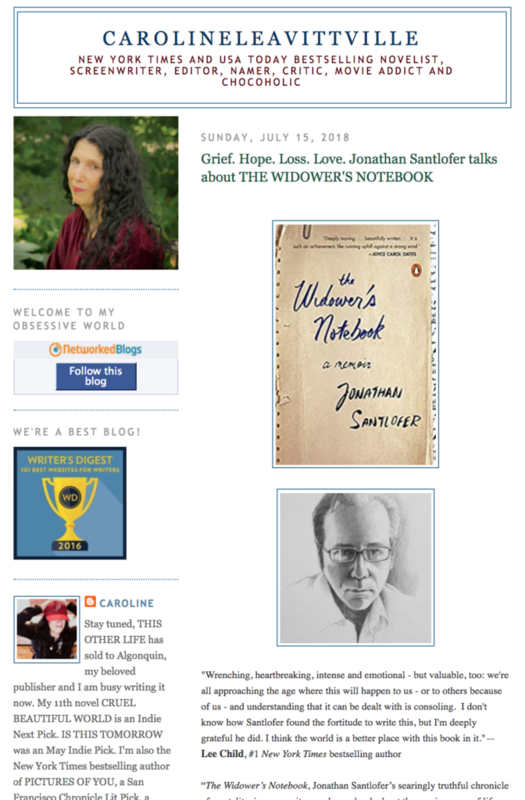 This entry was posted in Interviews and tagged Carloline Leavittville, Joy Santlofer, The Widower's Notebook. Bookmark the permalink.